Yesterday I sewed the envelope for my rakusu, the final step in my sewing process. All nine of us were present yesterday, coming together one last time specifically to work on the envelopes, even though many in the group are not quite done with the rakusu themselves. But all are so close – so close! Our teacher, Tony Patchell, came to Sebastopol to pick up the two completed rakusu, Debi Papazian’s and mine. Our sewing teacher Connie Ayers had set up a small altar just outside of our sewing studio. She lit a candle and incense. Debi and I took turns passing our rakusu through the incense smoke three times, bowing to the altar, and then turning and bowing to Tony, handing him the rakusu. It was official. We were done! Sewing the envelope was especially fun because we got to be a little bit wild. The rakusu itself is pretty traditional, with its staid navy blue. The only deviation was that we were allowed to choose our color of thread. I chose a shimmering green. The envelope is made of the same navy blue on the outside, but on the lining, anything goes. Generally you use silk, something with some stiffness to help the envelope stay flat. But colors, patterns – go for it! I chose a green that matches my thread, with dragonflies. Jukai is now five months away. So after pouring myself into this sewing for the last six months, I have now just given it away, and I won’t see my rakusu again until August. And then, the blank white silk on the opposite side will have my new Buddhist name, and I will be taking refuge in Buddha, dharma and sangha. Five more months. It was a big moment in sewing class today. Debi Papazian finished her rakusu! She is the first in our group to successfully complete the face, straps and envelope, and is now an official sewing graduate. There are nine of us, seven from the Healdsburg sangha, who have been meeting weekly on Sundays since October to work on our rakusu in preparation for jukai, or Zen lay ordination, which is scheduled for August. When our sewing teacher Connie Ayers first said we would probably be meeting through February, I thought, geez, it won’t take that long! This flippancy, however, was born of naivete. It arose from a place of ignorance, before I was properly introduced to the myriad intricacies, convoluted patterns and layers upon layers of stitches that comprise a Zen rakusu. As you can see by my rakusu, pictured above, I am not quite ready to graduate. Now, February seems alarmingly close at hand. I have been assured (repeatedly) that this is not a race. What do you mean, not a race? It’s a class, right? Classes are contests! That’s what I did throughout my academic life – enroll, study hard, excel, revel in the high grades. Well, with a couple of exceptions, of course. There was that disastrous home economics course my mother forced me to take in ninth grade. I somehow skated through the cooking portion, because we were assigned to teams. On my team, the other two girls cooked, and I ate what they cooked. It worked beautifully. Unfortunately, when it was time to sew, I didn’t get to share my A-line skirt with someone else. I had to make my own. Let’s just say “horrid,” and leave it at that. I haven’t been near a needle since. What I am truly beginning to appreciate through this experience is the nature of the student/teacher relationship. Connie has been so patient, and so gentle in her tutelage, moving from person to person around the room. Barely a moment goes by without one of us raising our hand in the air and whimpering, “Connie, can I be next?” When one is confidently stitching away, her neighbor has just knotted her thread in the wrong spot. As another masters the art of pinning, his neighbor finds he has mistakenly sewn through three layers of cloth instead of the aimed-for two. None of us are ever at exactly the same place at exactly the same time. And yet, somehow, Connie manages to keep us all occupied, soothed, supported, challenged, and committed. Now, that’s a teacher. So I’m not at the head of the class. I’m learning it feels pretty darn good simply to be showing up. Today I finished the patchwork face of my rakusu. I am amazed that I have come this far – it actually looks the way it is supposed to look, which is nothing short of a miracle, given my past history with sewing. I missed the last two weeks of sewing group, first because our teacher Connie was out of town, and then because I was home tending to my little dog Houla. At our last session before that break, I was “ahead” – keeping pace with one other student, I was farthest along on the project. But the missed time meant that now I am more in the middle of the pack, with three people significantly deeper into the sewing. While I was concentrating on my final vertical seams on the front piece this afternoon, I was overhearing the instructions they were receiving on the next steps, and I often glanced in their direction to see what was in my near future. They were marking and cutting the frame, pinning and sewing the frame, measuring the white fabric that will lie on the reverse side. Two things happened: one, I didn’t like being “behind.” As much as I knew it was silly, as much as I know this is not a race, I love being “ahead.” That’s a very, very old habit, and one which is definitely in need of revision, so it’s probably excellent practice for me to lag behind. In fact, I should stay behind for the rest of the classes, just to work on sitting with that uncomfortable feeling. The second thing was this – I began to stew and fret about the future steps. They looked hard; I didn’t fully comprehend what others were doing. It seemed like I would not be able to execute the tasks when it came time. What a great metaphor for staying in the moment! When there was no future, I had no worry, and I was completely competent, with “beginner’s mind” fully intact. As soon as a future appeared, I began to fret, and “expert mind” took over, leaving me feeling absolutely stymied. Today, I realized, I was sewing with “Worry Brain.” As soon as those words came into my head, I laughed to myself. Ah, I recognize you! I gave “Worry Brain” a little talking to, quietly coaxed “beginner’s mind” to come up out of hiding, and got back to work. So goes the sewing. Life lessons with every stitch. I met on Sunday again with my jukai group to work on my rakusu. Amazingly, it is actually beginning to look like a rakusu, since I am far enough along to have sewn together several of the strips for the face, into that wonderful rice paddy configuration of alternating long and short pieces. There are nine of us in total, although so far the gatherings have consisted of at most six people, as we all struggle with scheduling conflicts. Two are from a group in Sebastopol; the other seven of us are from the Healdsburg sangha. We meet at the home of Connie Ayers, our sewing instructor, in Sebastopol. The big open room that we sit in has a large work table, a small altar, and an ironing board. Scattered about the work space are half a dozen desk lamps, an iron, a box of pairs of scissors, another box filled with metric rulers, and our own individual sets of cloth, pins, needles, and thread. We spend the four hours on Sunday afternoons bent in concentration over our project, pinning, stitching, and measuring. At times, I look around the room in wonder at it all. Who would have thought, even five years ago, that I would find myself here? Part of a Zen community, pursuing lay ordination – I had no idea this was in store for me. And sewing? Never would I have guessed that I would be sitting, needle in hand, making something myself. I love the satisfaction of creating this rakusu with my own hands. It is a meditation practice, a building of sangha, and a creative act, all rolled into one. I am evidencing my Buddhist vows, one stitch at a time. I was immersed in art/work practice today, spending the morning glazing my jizo (see link for more information about this Japanese Bodhisattva) and spending the afternoon working on my rakusu, the symbol of jukai (lay ordination). My jizo survived his first firing, and somehow I managed to get a little bit of my vision of a Bodhisattva into the clay, much more so than in my first attempt. Although I’m trying very hard to just let each one exist on its own, without my judgments, I seesaw back and forth from feeling artistic pride (Wow! I made this!) and an art critic’s scorn (A third grader would have done a better job.). We met in Susan Spencer’s studio in Sebastopol, which is an art lover’s paradise. Her garden is filled with ceramic figurines of all colors, shapes and sizes, from the whimsical to the spiritual. The ceramic studio has a big work table, and shelves lined with paint brushes, sponges, cutting tools and all kinds of miscellaneous implements. It’s hard to resist the call to create when you’re standing in that room. Today we applied glazes, which is both easier (since the surfaces to paint were large and fairly clearly delineated) and at the same time a leap of faith (since I have no idea what it’s going to look like when it comes out of the kiln the second time). Sangha member Debi was also with me, finishing the glazing on her feline jizo, a black cat Bodhisattva with wings and gold eyes. I love colors. It’s funny, because there was a long period in my life when I dressed only in black. Everything I owned was black – black bike messenger bag, black piano, black car. But at some point a few years ago, when the world got a little brighter for me, colors came back into my life. So choosing the glazing paints was heaven – sky blue, emerald green, rose pink. My jizo’s robe is textured, so I used a sponge to wash some of the color off, leaving indentations of color beneath the ridges of clay. At the end, I covered the entire figure with a clear glaze, which dries white, completely masking all the work I had just done. Again, trust comes into play – the colors should reappear after firing. That’s what I’ve been told. I had a wonderful time getting paint all over my shirt, cradling the jizo in my arms while I applied the brush, feeling the weight and roughness and “I am that” -ness of it all. And then, on to the next adventure. At sewing class, there were only four of us, due to a house blessing held this afternoon at sangha member Deborah’s, so our teacher Connie Ayers was able to give lots of one-on-one attention. We practiced stitching, ironing, cutting, and marking. But then I got to move on to the real deal, the cloth for my actual rakusu. I ironed the face cloth, for the front piece of the rakusu, and then Connie helped me apply the pattern and mark lines. On to cutting – which made me nervous, because that can be screwed up, but I made it through without destroying anything. The next simple step, ironing the folds on five pieces of cloth, I managed to bungle, doing it the opposite of what I was instructed. Thankfully, though, it was salvageable – just more ironing. The final step was to pin the first five segments, which again took some doing, but I survived with help from Connie. Now this week I have to take the big plunge – make my first stitches on those pieces of cloth. This whole sewing thing is fascinating for me. I am so surprised how pleasurable it is. Once again, as with the clay, there is that sense of work and of art. I am making something with my own hands. I am a word person. I make my living sitting at a computer, writing news stories and designing pages, which are sent to the printer electronically. At home, I spend hours in front of the screen, doing my own writing, blogging, emailing. I exist in an environment of ideas and papers, metaphors and keyboards. To sit down at a table and pick up a lump of clay and roll it in my hands, to wield a paint brush, to thread a needle, to iron and tie knots and draw lines – this is opening me up. It’s like the breath in zazen, a reminder that I have a body as well as a mind. Last Sunday I began sewing my rakusu. 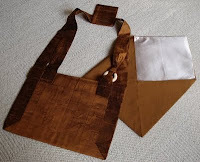 A rakusu is a patchwork miniature robe that you wear around your neck: navy blue for lay ordination (jukai), black for priests, brown for those who are able to teach, having dharma transmission. I’ve heard there’s also a green one, for lay people with dharma transmission, but I’ve never actually seen one of those. Hand sewing the rakusu is one stage of the year-long preparation for jukai, taking Buddhist vows. I am part of a group of seven from my sangha who will go through the ceremony next August. For the next three months, we will meet every Sunday to sew together. The sewing is a form of meditation. As you do each stitch, you chant to yourself: Namu kie butsu. I take refuge in the Buddha. We work with a sewing instructor, Connie Ayers, who guides us each step of the way. Still, it is a difficult task for many of us. Last week, several in the group, myself included, were all thumbs, completely unfamiliar with even the most basic steps involved in sewing. I’m guessing that the lesson in patience is as integral to this practice as the meditation. Despite the fact that I can barely sew on a button, so far I am enjoying the practice. It appeals to the detail-oriented part of me, with the single-minded attention towards the task. I am sure, though, that over the next weeks there will be at least one post where I throw my hands up in the air over the whole ordeal, frustrated beyond soothing. Bear with me. I’ll do my best not to whine too much. For a great article on the rakusu tradition, see Taking the Precepts: Sewing Buddha’s Robe by Josho Pat Phelan.